Surprise is an extremely powerful weapon in chess and especially in the opening. A player who is surprised in the opening will often lose heart completely, and fail to put up proper resistance. It needn't even matter if the new idea isn't actually very good: the psychological effect of being caught out and dragged onto unfamiliar territory that the opponent knows well can be quite enough. World championship matches have turned on games featuring new ideas in the opening that analysis quickly showed to be harmless - but when it was too late to help the victim. This, however, is not a book aimed at world championship candidates (though I hope they might find something of interest here too). This book is intended to help keen amateurs, club, county and tournament players to get the better of their opponents in the opening, and the ideas presented have been selected with that aim in mind. Before we set about trying to surprise our opponents, we should consider just what surprise is and how it is caused. This subject has been discussed in detail by Amatzia Avni in his book Surprise in Chess, so I shall only discuss the elements relevant to the opening. Essentially, the opponent will be surprised when we don't play according to the principles that he expects us to, or that he thinks are correct. If he has been brought up on dogmatic principles, then even something like putting a knight on the edge of the board, no matter how appropriate and sensible this may be in the given situation, will probably cause some offence. Anything we can do that seems to violate their opening principles will tend to surprise opponents. Of course, we need to be sure that what we are doing does actually work, and is justified by the specifics of the position: if we are playing several moves with one piece, we need to be sure that the square it is aiming for is worth the cost in time. If we give up the bishop pair, then we should think our knights have good footholds from which to exert their influence, etc. 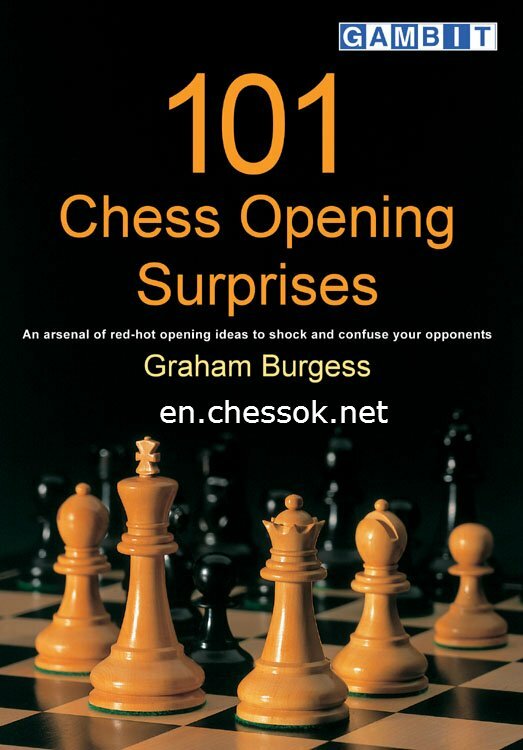 Title: "101 Chess Opening Surprises"